There isn’t a lot growing in my garden at the moment . A couple of of parsley plants, some sprouting broccolli (which isn’t yet sprouting), a few varieties of oriental salad greens, a bit of swiss chard, and kale, lots of kale. I thank the garden gods for kale. 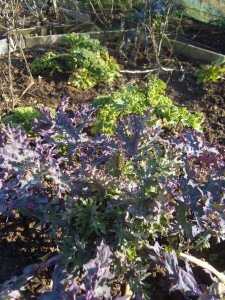 All through the winter and early spring its there , providing a much needed source of fresh greens. Its extremely versatile and has a delicate an almost perfumed flavour. Just dont overcook it . We add it to salads , cook it with cream and garlic, use it in stir frys, make soup, bake it into pies and quiche and my favorite ,turn it into Colcannon. The market stalls are full of kale at the moment so get out there and get some. I know Colcannon is the traditional Halloween dish but I love it so much we have it all the time. I dont have exact measurements for this as it depends on how much kale to potato you like . As a rough measure we add twice as much uncooked kale as potato. So one colander of potatos to 2 squashed down colanders of kale . We eat it on its own with lashings of butter. Sometimes we put the colcannon in an ovendish , make some egg sized holes ,crack some eggs into them and then cover the whole lot with cheese and bake for about 20 mins. Yum! 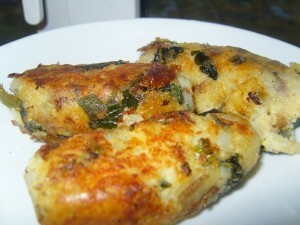 Last week we had some left over so I made colcannon cakes . I just rolled the left over colcannon onto fat sausage shapes and fried them in a butter and oil mixture. The reason for the sausage shapes is because you can fit more on a frying pan in that form than in flat cake shape and it saves so much time. Not all kales are created equal. Some varieties have been bred for cattle fodder and the taste and texture show that. So dont buy rough coarse leaved kale .The varieties we grow are Black Tuscan Kale, Irish Seedsavers variety ” Raggedy Jack” and Dwarf green curled. Sow seeds in April and May in seed trays and plant the seedlings out June or July. 18 inches apart. 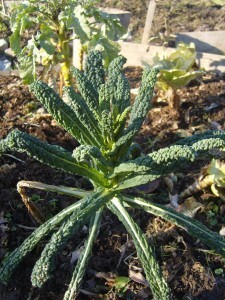 Kale is much hardier than other brassicas and will grow in any reasonable soil.